I am Hilary Cheng and with my family moved to Chingford in September with pastoral charge of three churches in the Circuit. Accompanied by my family, we have spent the last eight years in the Cambridge Circuit, where the children completed their secondary education. My husband Leo, is an Oral and Maxillofacial surgeon at Barts and the Royal London Hospitals, where he has worked for the past eleven years. My move to London enables us to live under the same roof again, instead of living in two different locations. For many years now, Leo has given a fortnight’s annual leave each year to work on the Africa Mercy, a hospital ship that has offered free surgery to many of the poorest people who live in West Africa. Other members of the family have also worked on the Ship, and this year, we had the unique opportunity to serve on the Ship together, all four of us, for the first time. It was a wonderful experience and we have been truly blessed by it. Leo and I are looking forward to our forthcoming trip next year when we will be going to Madagascar. 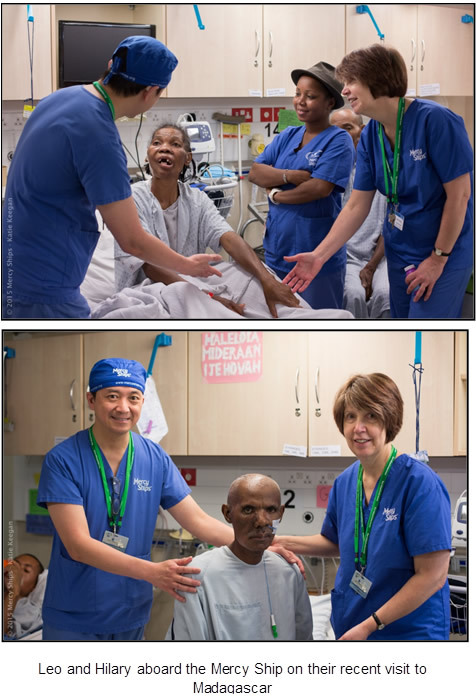 While Leo offers life-transforming surgery, I work as a Chaplain to the patients, talking with them, praying for them and being alongside them while they are hospitalised. My background lies in nursing and midwifery. I have been fortunate to work both in this country and in the Far East, in well equipped western hospitals and in a refugee camp where only the basic facilities were available. A recent course in Spiritual Direction has broadened my understanding of spirituality and how this works both inside and outside the church. I enjoy music and reading, when time permits, and am out walking with the dog every day. Gardening is very therapeutic, and I derive pleasure from Ikebana, the art of Japanese flower arranging. I am delighted to be in the Forest Circuit and am looking forward to getting to know you. The area is unfamiliar to me but I have been entranced by the beauty of the Forest and the way it wends its way down through the circuit.